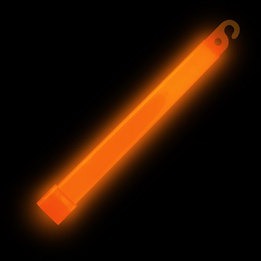 The 6 inches orange glowstick is a must for the events where you need to stand out. Perfect for Halloween parties to add that orange touch or great for children`s security to make them visible on the streets on Halloween night. Each stick comes with a nylon cord so it is very easy to hang or suspend the glowstick from a desired location to add a small touch of light to your decor. Very easy to activate, you simply have to crack it, shake it and it`s good for a duration of 6 hours.,and then the glow will slowly fade. Sold in bulk with 25 units, Nylon cords included - this bright festive accessory is not recommended for children under the age of 5 years old.